So I missed my rez day back on December 2nd. I cannot even believe I could miss such an important day. I guess I’ve been way too busy. Anyway, I unearthed a picture that I thought I lost today. I was cleaning up my blog and I found it! I had done a collage of myself every year up to a certain point. So… I saved the picture and added 4 more years of pictures! Here it is! 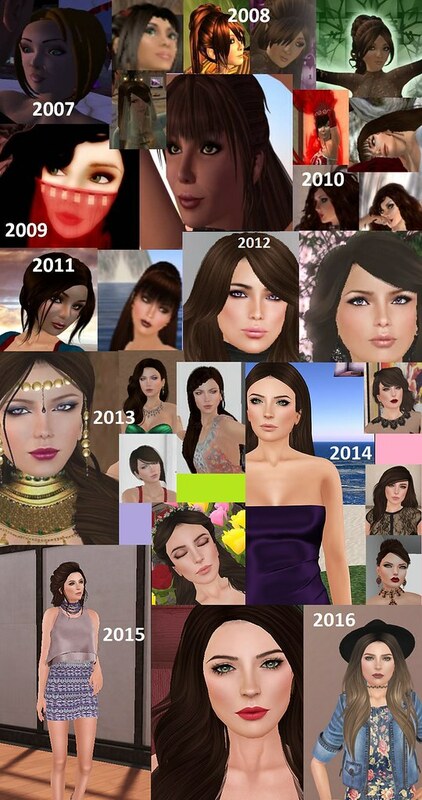 Second Life has changed so much in 8 years and I am so excited to see where it goes from here! One more to go! I even have the perfect outfit set up for the last look. Want this look for the holiday season? Head to faMESHed! The dress is the Rebel Hope dress out and the jewelry is the Maxi Gossamer one there. The hair is from Wasabi Pills called Veronica. Skin and make up is from Pink Fuel and as always, I am wearing Harley in vanilla. It would seem we are on a roll! I am happy Sookie caught herself up but I am also sad. That means that we are coming to the end of the challenge. You can get the look from Elikatira, Ison, League, Pink Fuel, Maxi Gossamer, Izzie’s, and Shabby Cat. So, Sookie is almost caught up with the color challenge and there is only 3 weeks to go! Wow, I cannot believe I have gotten this far. I’ve never missed a week since I started. Dress yourself at Elikatira, NYU,, Fri.day, SLink, and Pink Fuel! I am so screwed up with which week we are in. The Twisted Color Challenge is off schedule. However, this is the 48th color combination in the series. For my look, I went with a springy look. With it being so cold and icy… oh yeah and snowing, I just had to bring out the season of rebirth. Santa baby… hurry down the chimney tonight! There is a new release from Redgrave! The X-Mas Costume is for women and it is done in liquid mesh. Always make sure to demo the mesh to make sure it will work on your viewer. FYI… it works on the new alpha release of the Firestorm Viewer and also the Second Life viewer. This comes as a one size fits all and I’ve played with my shape and found it mostly fits. Try it! You will probably love it! Happy days after Thanksgiving and day after Black Friday! The holidays have been awesome. I am beyond filled with turkey and all the fixings. I hope everyone has had a nice holiday. Even if you are in a country that doesn’t celebrate, I hope your last few days have been nice. Even with all the fun of the holidays, I cannot help but complain. Why the hell does it have to be so cold? I know I know… it is fall. Today it was 26 degrees. Does it really need to be that cold? When I step outside, I get hit with this blast of cold and all I can do is shiver. While I nowhere near have the money to travel… why should that stop Liliana? With an idea in my head, I roused her from cleaning up her skybox and got her ready. Where to go? Somewhere tropical and most importantly NOT HERE. That means bikini shopping! Yeah. Send me for something easy like bikini shopping and you know what I end up with? A holiday outfit! What! FaMESHed opened today and I just had to shop! I promise I’ll go on my SLacation! These boots are from Mutresse at faMESHed. They come in awesome colors changeable by hud. Just a heads up, I tinted these boots because the black offered was a little light for me. Dress is from hucci and hair from exile. Tights from Maitreya (not a slink addon). Jewelry from Maxi Gossamer of course!